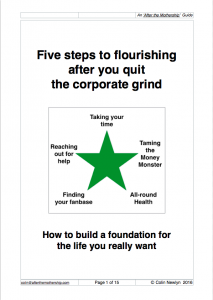 This Guide explains the five areas that you need to focus on to create the stability and resilience you need and to get you back at the top of your game, ready to create the life you really want. It also suggests some actions you can take to build a solid foundation for the next stage of your life and career, and to keep that foundation strong. This is the advice I wish I had been given on the three occasions I was made redundant and when I eventually left corporate life to ‘do my own thing’. In the absence of this, I have struggled unnecessarily and found it much more difficult than it ought to be. I hope these lessons, learnt through painful experience and much careful study, will help you to make your journey shorter and sweeter.